British Vogue celebrates its 100th birthday this summer and what better way to mark it than with a fashion campaign featuring a model who is the same age as the glossy magazine. British high-end retailer, Harvey Nichols has devised the campaign around the centenary issue which will be in shops this Thursday, the 5th of May. 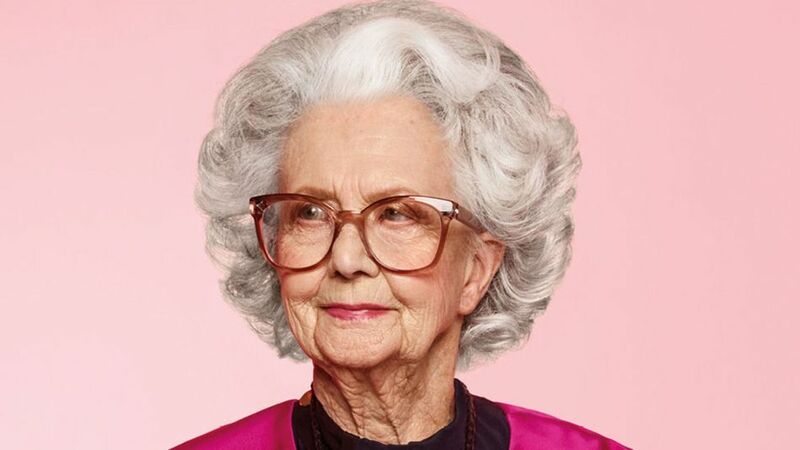 Model Marjorie ‘Bo’ Gilbert, from Birmingham, was born in 1916 and has enjoyed her first shoot for this campaign. She is a very stylish lady who has refused to let age come between her and her love of good fashion. She says ‘I love wearing nice things, it’s always appealed to me and it still does’. The campaign was shot by internationally renowned photographer, Phil Poynter and Bo looks wonderful in the Dries Van Noten coat and The Row trousers which are complemented by a Lanvin necklace. In addition to the contribution Harvey Nichols are making to the centenary issue of Vogue, they have also shot a short video, directed by Kell Stewart, which lets readers get to know Bo a little. She comes across as very much her own lady, she knows her own mind and insists that she just suits herself when it comes to fashion. Over the course of the video she describes some of the fashion moments which were important to her. She recalls how years ago hats were a fashion staple, and laments the fact that it is rare to see people in hats today. Trouser suits from the fifties were another favourite. In terms of Bo’s own style inspiration, Audrey Hepburn was always her favourite, she thought she was ‘beautiful’. Though Shadi Halliwell, from Harvey Nichols has commented how, much like her style icon, Bo herself is a ‘fabulous, independent lady who epitomises timeless style’. British Vogue’s centenary edition is set to be its largest one to date and the magazine has been burgeoning over recent months as the big 1-0-0 approaches. Vogue editor, Alexandra Shulman, believes that ‘Vogue’s centenary year is an opportunity to celebrate the success of a magazine that has been the leader in the field of fashion, style, contemporary personality and lifestyle since 1916’. With a host of projects planned over the course of the year there is much more to come from Vogue. As Sophia Loren is quoted as having said, ‘there is a fountain of youth: it is your mind, your talents, the creativity you bring to your life and the lives of people you love. When you learn to tap this source, you will truly have defeated age’. We think both Vogue and Bo have been successful in this regard.